Frac sand mining: What are the alternatives? 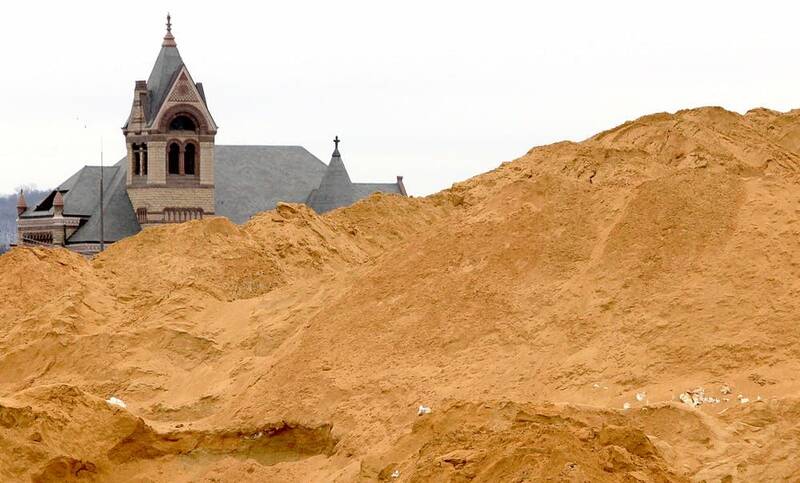 As companies in Wisconsin and Minnesota move ahead with plans to mine frac sand, those drilling for oil and natural gas in other states are asking whether alternatives might someday be cheaper than shipping the sand hundreds of miles. Sand is used for what's known in the hydraulic fracturing world as a proppant — it props open fissures in the earth to extract oil and natural gas. Silica sand has been the cheapest proppant available for fracking, but there are also manufactured proppants, usually made of ceramics. Right now the ceramic alternatives are much more expensive, but companies are experimenting with different ways to bring the cost down. One idea is to manufacture it near where the fracking is taking place, using local clay. "If they can manufacture it here it'd be very close to the source," said Ed Murphy, North Dakota's state geologist. Murphy studied clay deposits in western North Dakota and found many were rich in kaolin and had aluminum oxide — two important ingredients for ceramic proppants. The state has provided maps and other analysis to companies that might be interested in using the clay to manufacture proppants. Murphy said it's hard to know how soon that could happen, but he said interest has been high. North Dakota's 186 wells use about 4 million tons of proppant a year, he said. Most of the manufactured proppant used in North Dakota is made in China and is costly to ship, he said. "That's why we went ahead and did this study," Murphy said. "We actually started this project in 2011 and at that time we were hearing interest, and that's continued." For now, sand remains king. It makes up about 90 percent of the proppant market overall, according to Brian Olmen of Kelrik, a Wisconsin-based consulting firm that analyzes the industrial minerals industry. But Olmen said ceramic proppants play an important role in the industry. In some cases, they've been found to be more effective than sand in extracting gas from especially tight formations, said Steven Ilkay, an oil and gas industry consultant. The fracking industry is still developing, and companies have been experimenting with different ways to use sand and other proppants, he said. "There's no industry consensus on exactly the one way on how to frack and complete a well," Ilkay said. Bill Mavity is among those who believe manufactured proppants might someday put mining operations in the Midwest out of business. The retired lawyer lives on the Wisconsin side of Lake Pepin, and became a county commissioner to help keep frac sand mining operations in the area small so that mines would have fewer long-term impacts when they are abandoned. Mavity has been following the developments in alternatives to sand. "It became clear to me that if the technology developed pretty quickly, it would no longer be feasible cost-wise for the industry to mine frac sand," he said. Mavity said the prospect of ceramics replacing frac sand makes it that much more important to limit the size of sand mines and require them to have good reclamation plans. "I think the frac sand industry is pretty short-lived," he said. But frac sand will be needed for years to come, especially as other regions of the world look to begin fracking for oil and gas, said Emma Hughes, deputy editor for Industrial Minerals, a London-based publication that analyzes the industrial minerals markets. Hughes said she expects plenty of discussions comparing frac sand to manufactured proppants when her publication hosts an event for industry insiders in Houston this June. "In the future it may get to the point where the manufactured proppant has come to the point where it's as good and a similar price," Hughes said. "There may come a time when that's the preferred choice for everyone, but I don't think that time is close by."